The concluding chapter outlines the main contributions of the book and areas for further research. 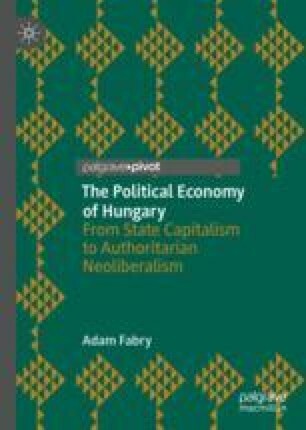 The main conclusion of the book is that, rather than a sui generis process, the ‘double transformation’ in Hungary and elsewhere in the former Soviet bloc was shaped by the wider neoliberal restructuring of the capitalist world economy since the 1970s onwards. A second conclusion of the book is that domestic social forces have played an important role in mediating pressures for neoliberalisation. For example, in the case of Hungary, ‘radical’ reform economists associated with the influential Financial Research Institute (FRI) played a key role in disseminating ‘proto-neoliberal’ ideas and practices prior to the regime change in 1989–90. Related to this, the book emphasises the inherent limitations of the neoliberal regimes that emerged in Central and Eastern Europe (CEE) and the former Soviet Union after 1989–91, and the growing fusion between neoliberal economic policies and authoritarian state practices in the region in the wake of the 2008 global economic crisis. Finally, the book suggests that further research is required in order to gain a better understanding of the comparative political economy of neoliberalism and the relationship between left-wing political forces, broadly conceived, and neoliberal development globally.